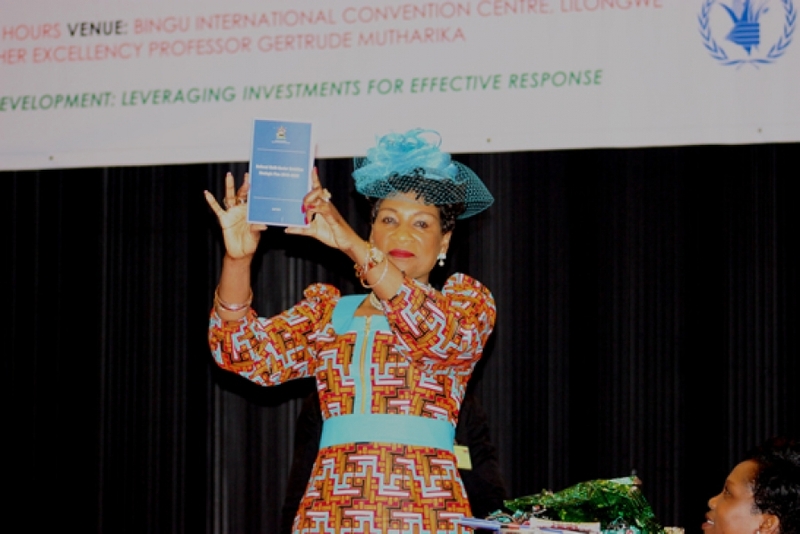 Malawi First Lady, Madam Gertrude Mutharika, launched the 2018 – 2022 National Multi-Sectoral Nutrition Policy (NMNP) and Strategic Plan on 20th June 2018 in Lilongwe. The First Lady commended the launch of the policy, describing it as a critical ingredient for Malawi’s national development, which she said needs coordinated and multi-sectoral approaches. During the launch, the United Nations pledged to continue supporting evidence-based and high-impact nutrition-specific as well as nutrition-sensitive actions at scale, through an equity approach, ensuring that no one is left behind, especially the most vulnerable, including children, women and adolescents. “The UN is committed to continue contributing efforts towards reducing malnutrition in Malawi. We will continue working together for effective support and align our actions in-line with the National Multi-Sectoral Nutrition Policy and respective strategies in collaboration with the Government of Malawi, Development Partners, NGOs and the private sector,” stated UNICEF Deputy Representative Roisin De Burca. Malawi has reduced stunting from 55 percent in 1995 to 37 percent in 2016, wasting from 6 percent in 2014 to 1.3 percent in 2018, and achieved significant reduction in Vitamin A deficiency from 59 percent in 2001 to 3.6 percent in 2016. De Burca said this is also an indication that investments in nutrition are paying off. Despite Malawi registering a success story in addressing malnutrition, the country still has a challenge of addressing overweight and obesity which are on the rise especially among women and children. The policy, which runs from 2018 — 2022, serves as a guiding document for national nutrition stakeholders, including government and development partners to promote evidence-based programming and strengthening of the national nutrition response, scale-up of evidence-based innovative interventions, re-alignment of nutrition interventions to the current national development strategy, the Sustainable Development Goals, and other new global declarations, which the government has signed. It is intended to provide guiding framework for the successful implementation of the national nutrition response, address the existing and emerging national and global issues and uphold governments commitment towards eliminating all forms of malnutrition. Government developed the first National Nutrition Policy in 2007 whose overall goal was to have a well nourished nation with sound human resource that effectively contributes to the economic growth and prosperity. The policy that has been launched, renews government’s commitment and strategic response to nutrition related issues by reviewing the National Nutrition Policy which is multi-sectoral and covers both nutrition and nutrition-sensitive interventions.